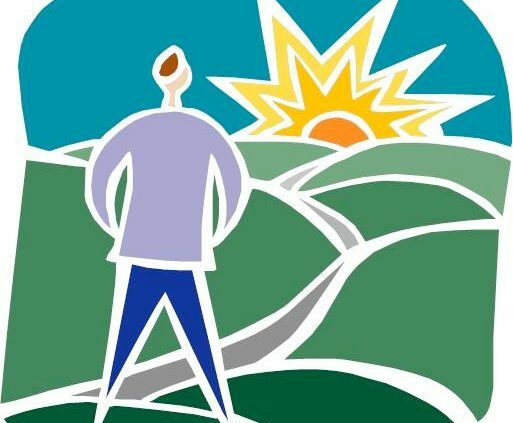 What is the Self-Determination Program (SDP)? The California statewide Self-Determination Program is a voluntary alternative to the traditional way of providing regional center services. The SDP is being developed by the Department of Developmental Services to allow participants to have more control over selecting their services and supports. One of the ways this can be done is by giving participants (or their parents or legal representatives) a specific budget to purchase the services and supports that they need to make their person-centered plan work better for them. Participants may choose their services and pick which providers deliver those services. Participants are responsible for staying within their annual budget. Authority (over your personal resources) – You have a budget, and you get to decide exactly what to spend that money on in order to reach your goals. Confirmation (of the important role you play) – In the Self-Determination program, you play a critical role as the person who makes decisions. You and your family get to choose the services and supports that will help you accomplish the goals in your IPP. For more information, visit the DDS Self-Determination Program Home Page or click here to read WRC’s Self-Determination Local Advisory Committee “Your Life, Your Way” presentation. How is the SDP different than my current service coordination? The way the Self-Determination Program works is different than the way services are delivered right now. The thing that makes self-determination so exciting is that it gives you flexibility in choosing your services, supports, and providers. In the Self-Determination Program, you can buy different services, not just those through the regional center. The program offers a lot of flexibility. Services can include, but aren’t limited to: individual training; vehicle adaptations; or support with communication. Your services and supports can be from almost anyone in the community. Right now, your Service Coordinator from the regional center is the person who helps you find the services you need. In self-determination, you get to decide who else you want to help you. This could be your family or friends, or an Independent Facilitator. There will be money in a budget and you will choose which services and supports to have to meet your goals. Self-Determination offers you the opportunity to be creative, think outside the box, and make your own plan for how you want to live. For more information, visit the DDS Self-Determination Program Home Page or view WRC’s Self-Determination Local Advisory Committee calendar. Consumers residing in a developmental center may be eligible for the Self-Determination Program if they are expected to transition to the community within 90 days. Participants do not have to be in the Medi-Cal program. During the first three years of the Self-Determination Program, enrollment is limited to 2,500 people. To help ensure the selection of the 2,500 participants is equitable, the following process was developed by the Self-Determination Program advisory group. What does someone need to do to be considered for enrollment? Participate in a required Pre-Enrollment Informational Meeting at your regional center. It’s important to hear, in greater detail, information about the Self-Determination Program. At this meeting, people will learn not only about the opportunities but also the increased responsibilities involved in accepting more control over coordinating their services. Understanding this information will help people decide if the Self-Determination Program might be a good option for them. 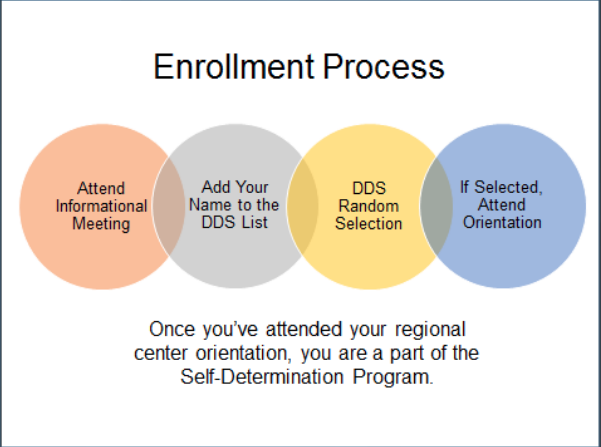 After participating in the required Pre-Enrollment Informational Meeting, let the regional center know you’re interested in enrolling in the Self-Determination Program. After you have participated in the required Pre-Enrollment Informational Meeting and you think that Self-Determination is a good option for you or your family member, you must let the regional center know you’re interested in enrolling in the Self-Determination Program. As discussed below, this does not guarantee you will be selected as part of the first 2,500 participants. What happens after someone participates in the required Pre-Enrollment Informational Meeting and lets the regional center know they’re interested? Regional centers send names of those interested to the Department of Developmental Services. Only those consumers/family members who have participated in a required Pre-Enrollment Informational Meeting will be eligible for enrollment in the Self-Determination program. The Department of Developmental Services will send confirmation to those whose names were forwarded by the regional centers. Those selected can enroll in the Self-Determination Program. The enrollment will be done through the regional centers who will work with each participant to enroll in orientation, establish an individual budget, etc. If not selected initially, consumers will remain on the interest list for future enrollment opportunities. After the first three years, the program will then be available to everyone. For more information, visit the DDS Self-Determination Program Home Page or view WRC’s Self-Determination Local Advisory Committee calendar. Updates on the status of the program will be posted to the DDS page as they become available by visiting http://www.dds.ca.gov/SDP/SDPUpdates.cfm . If you want to be notified when updates are made, please email sdp@dds.ca.gov and ask to be included on the notification list. This meeting that is held on the second Tuesday of each month at Westside Regional Center from 6:00-8:00 pm. The committee shall consist of the regional center client’s rights advocate, consumers, family members, and other advocates and community leaders. A majority of the committee shall be consumers and their family members. The committee shall reflect the multicultural diversity and geographic profile of the catchment area. The committee shall review the development and ongoing progress of the Self Determination Program, including whether the program advances the principles of self determination and is operating consistent with the requirements of this section, and may make ongoing recommendations for improvement to the regional center and the department. All are welcome to attend these meetings. For more information, please call Pamela Arturi (310) 258-4276 or Cesar Garcia (310)258-4090. As of October 1, 2018, the Department of Developmental Services (DDS) made the stratified random selection of the initial 2500 Self Determination Program (SDP) participants for the first three years of the program. WRC has 64 slots and after three years, the program rolls out to everyone. DDS will send a letter to those selected and will also be setting up page on their website at https://www.dds.ca.gov/SDP/ where you can check to see if your case has been selected. The case will remain with the individual’s Service Coordinator for now and they will continue to receive traditional services. Within the next two weeks, they will be contacted by WRC regarding the steps we will be taking together to transition the individual to Self Determination. This process is anticipated to take a few months. The first step will be a required Orientation Class that will be scheduled for early 2019 (see below). After that, work to begin planning, budget development, and the set-up of services will begin. It is anticipated this process will take several months. If not selected initially, individuals will remain on the interest list for future enrollment opportunities. In three years, the program will be open to all. The Westside Regional Center (WRC) Self-Determination Local Advisory Committee (LAC), made up of self-advocates and family members, and supported by wonderful staff, providers and other community members, is mounting an ambitious schedule to implement the Self-Determination Program at our regional center. WRC’s advisory committee will be hosting a training for Independent Facilitators later this year. Anyone from any part of California can sign up (see below) — registration will be sent out/posted at a future time. Below is our WRC Self-Determination LAC schedule for meetings and trainings through January, 2019. Please mark your calendars. Tuesday, 10/16 – Welcome to the Self-Determination Program! For selected participants only. Led by committee members and staff. Note: Participants will attend only one of the dates. More dates for additional orientations to come. You must be at BOTH dates to receive the certificate of attendance. View the directive related to Independent Facilitators and view the directive related to Financial Management Services (FMS) in the Self-Determination Program (SDP). This information is also available on the Department of Developmental Services’ (DDS) website at https://www.dds.ca.gov/SDP/SDPUpdates.cfm. DDS is continuing to work on additional SDP information, including training for local advisory committee members and regional centers on conducting participant orientations and guidance for developing the individual budget. Updates on progress in completing these and other items needed as we move toward implementation will also be posted on the Department’s website. If you have any questions, please send an email to sdp@dds.ca.gov. For more information, please contact Cesar Garcia at cesarg@westsiderc.org (310) 258-4090.